Add to My Favorite Store. 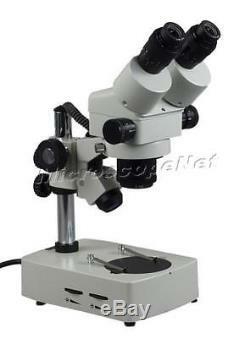 Binocular 3.5x90x Zoom Stereo Microscope. Dual halogen illuminators --- adjustable light intensity & inclined angle. Wide field eyepieces WF10/20 and WF20/10. Large Zoom Ratio 1:6.5. This is a binocular zoom stereo microscope. The equipped 0.5x barlow lens allows the user to have extra long 6-1/2 inch working distance and 2 inch extra large field of view. It has upper and lower halogen lights which are mostly used in a microscope. Although the life time is not as long as LED lights but they are easy to replace and very low cost for the replacement. The objective zoom rario is as high as 1:6.5. Plug and see, no special knowledge needed. Top quality optical glass elements. Extemely long working distance and field of view with 0.5x eauxiliary lens. Individual adjustable intensity incident and transmitted lights. Upper (incident) light has 90° inclination range. Sharp erect stereo images over a wide field view. Both ocular tubes have diopter adjustment. Adjustable inter-pupillary distance to fit anyone's eyes. Product GS and CE approved. Eyepieces: wide field WF10X/20 and WF20/10. Zoom ratio: 1:6.5. Objective zoom: 0.7x4.5x. Auxiliary objective lens: 0.5x. Both ocular tubes have diopter adjustment ±5dp. Interpupillary distance: 2-3/16" 2-15/16"(5575mm). Working distance: 3-3/4" (95mm) without 0.5x auxiliary lens and 6-1/2" (165mm) with 0.5x auxiliary lens. Focus adjustment stroke: 2-3/8 (60mm). Incident (upper) illuminator: 12V/10W halogen, 90°adjustable inclined angle range. Transmitted (lower) illuminator: 12V/10W halogen. Each light has its own intensity control with power on/off switch. Auxiliary objective/ring light thread: 50mm in diameter. Clear glass stage plate: 3-3/4 (95mm) in diameter. White/black plastic stage plate: 3-3/4 (95mm) in diameter. Power supply: 100V240V, 50Hz/60Hz (US and Canada Plug). Dimension: 9-1/2 " x 6-3/4" x 17-1/2 (23cm x 16cm x 44cm). Net weight: 12 lb 9oz (5.7kg). A pair of WF10X/20 eyepieces. A pair of WF20X/10 eyepieces. Black/white high quality plastic stage plate. Gooseneck fiber cold light (ring type and Y type). Digital camera adapters (Nikon, Olympus, Canon, Ricoh). Spare halogen bulb 12V/10W with reflector. We are here to exceed your expectations! The item "Stereo ZOOM Binocular Microscope 3.5X-90X Large Field & Distance" is in sale since Friday, February 06, 2015. This item is in the category "Business & Industrial\Healthcare, Lab & Life Science\Lab Equipment\Microscopes". The seller is "bh542" and is located in Northeast. This item can be shipped worldwide.